Felix Hernandez had a good game going until he didn’t, and the Mariners lost a chance revive their chances to catch the A’s as Oakland split the series with an 8-2 triumph. Oakland went through Hernandez and three relievers in the sixth inning to score four times and break open a tie game as the A’s rolled to an 8-2 win. So instead of heading into the final 25 games of the season 3½ games out of the final wild card spot in the American League, which is what a win would have brought Seattle, the Mariners are 5½ games behind the A’s and face a Kilimanjaro-ish climb in the final four weeks if their season is to stretch past Sept. 30. The closest the Mariners have come to the playoffs in the last decade and a half was the 2014 season when Seattle won four straight to finish with 87 wins. Hernandez allowed one run in locking up that 87th win. The Mariners needed the A’s to lose their finale while Hernandez was finishing up a 15-6, 2.14 ERA season, but Sonny Gray pitched Oakland past Texas for win No. 88, blocking the Mariners’ path. This time around, Hernandez allowed one run in five innings and was as close to looking ace-like as he’s been in a while. It all collapsed in the sixth after a leadoff single from Chad Pinder. Felix threw a wild pitch, walked pinch-hitter Matt Joyce, then threw another wild pitch. Marcus Semien singled past shortstop Jean Segura for two runs, and the vultures began circling. It was nine pitches, starting with Pinder’s single and ending with Semien’s hit. Both manager and pitcher said the walk to Joyce was the deal-breaker. 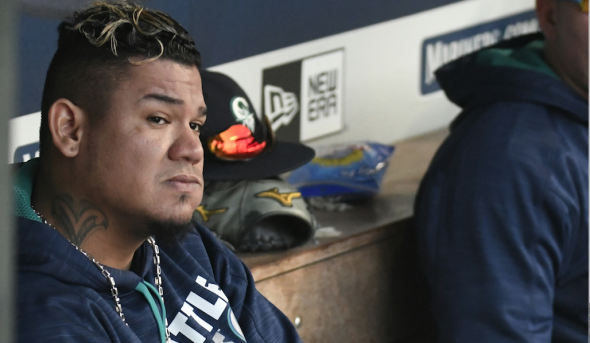 There’s a bigger problem now facing Seattle as the Mariners return home to start a three-game set against the team with the worst record in baseball, the Orioles, beginning Monday. That will be followed by three against the team with the second-best record in the majors, the Yankees, beginning Friday. The Mariners haven’t lost to the Orioles in four games this year, but they haven’t beaten the Yankees in three meetings. “The approach stays the same,” 3B Kyle Seager said. “Obviously we’d like to switch places with (the A’s). We’d rather be ahead than chasing. At the same time, you can’t concentrate on too much more than today. It’s too soon to say the Mariners have no chance – they do have three more with the A’s in Seattle the last week of the season. In splitting the series, the Mariners seemed to show at times that Oakland was running on fumes. But the A’s keep driving, and their edge over the Mariners has proven difficult to chip away, Oakland having lost just two of its last 22 series. Oakland has 24 games left. If the A’s simply just play win-one, lose-one, they’d finish with 94 wins. For the Mariners to get to 94 and force a playoff for the final wild card spot, they’d have to go 18-7 the rest of the way. Seattle has done that – from May 18-June 13 they had a 25-game stretch in which they won 20 times. But it’s been a while since we’ve heard from the team that did that. In their most recent 25 games Seattle has gone 12-13, and seven were against the A’s (3-4). Seattle had a chance to knock A’s starter Edwin Jackson around after Nelson Cruz, who’s battling a sore left foot, singled home a run. Denard Span doubled, and the Cruz made it to third with two out. “In the first inning, I loved where we were at,” Servais said. But Healy grounded back to Jackson – “he just got me,” Healy said – and Seattle wouldn’t score again until a Healy single in the eighth cut the deficit to 5-2. Moments later, however, Stephen Piscotty hit his second homer of the game, a three-run shot, and that was that. If the A’s would somehow go into a major collapse, that would help, too. Two runs isn’t going to win many games. I’m still enjoying the season and like the recent additions to the team in the last two years. Most predicted the two big contracts wouldn’t produce as their value suggested in the final years. It’s true. Next year won’t be any easier. It’s all about the farm system. Not the free agent deals. 1964. The Year of the Blue Snow. Phillies had a 6 1/2 game lead with 12 games left. Then disaster struck. It’s baseball. Anything is possible until it’s mathematically not. But yeah, it looks dim for the M’s. The first half of the season was clearly going to play easier for them than the second half. Not just because of schedule but because you could not project 175 innings this year for any of the starters and that was going to have a negative impact on the bullpen by late summer. But 12th of 15 teams in runs scored? Someone should compare the salaries of the starting 9 position players with runs scored and then rank the 15 teams in the league accordingly. It would be interesting to see what you get per dollar paid. Excellet article, Mr. Hickey. I believe you nailed it. He did well, as always. Such flattery. John was an original member of SPNW, now working in Oakland, where he was kind enough to share his wisdom for a few stories on relevant games.